All materials printed or produced by the Marietta College Department of Athletics, or in the name of Marietta College Pioneers, will adhere to the guidelines of the Marietta College Athletics Visual Identity. The graphic elements contained in this guide are not to be altered in any manner and are reserved for use by Marietta College Athletics only. The Assistant Director of Athletics or Director of Creative Services must approve any exceptions. Individuals may not order any merchandise (clothing, stationery, etc.) that does not conform to these guidelines, including all items purchased/produced in-house or by third-party vendors. Apparel-related items may require additional guidelines. When printing the names of individual teams and programs, the College's approved, specially designated type font must be used. Each of the images shown in this guide must appear in a horizontal and square position. No other format is acceptable. Use of any previous images, letterhead and other athletic design elements must be discontinued as new items are ordered. In accordance with all graphic standards and uniform guidelines, images shown are only a sampling of how the logos will be personalized to fit each athletic program. Marietta College’s athletic visual identity is based on a system of official graphic marks, coordinated to help the public easily identify College athletics and to promote Marietta’s distinctiveness and visibility among its many important audiences. 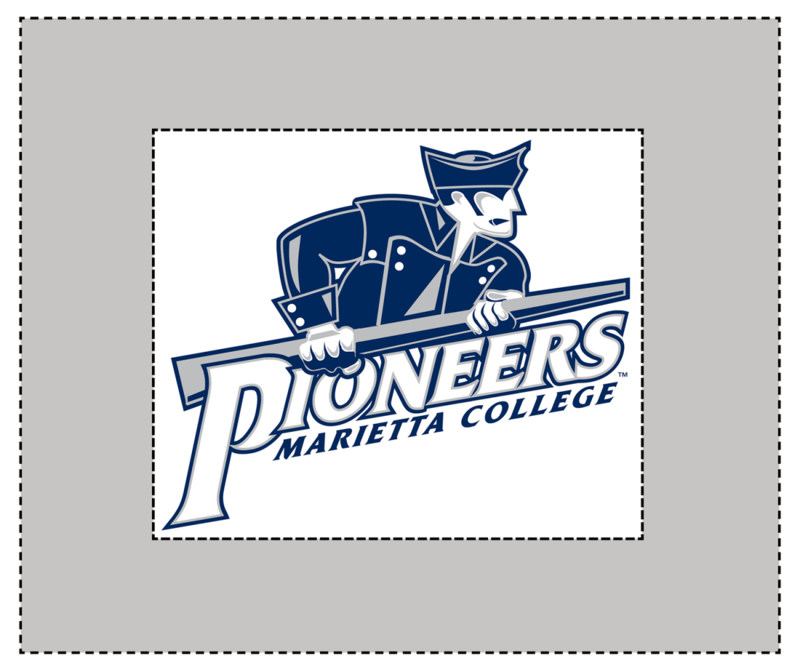 The images depicted are the official athletic visual identity marks of Marietta College. To promote strength and consistency—and to protect important trademark registrations—use of these marks should adhere to the graphic standards outlined in this manual. 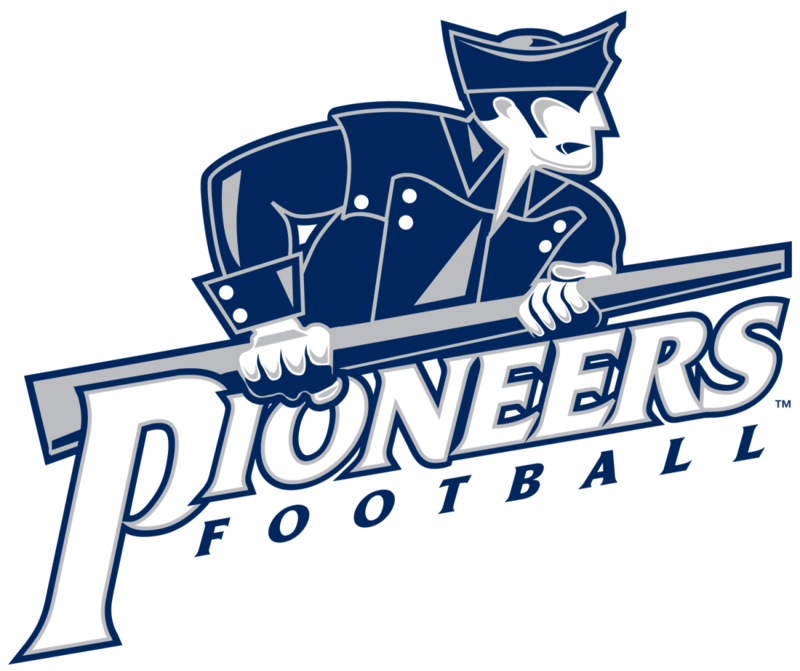 The primary Marietta College Pioneers athletic logo uses a stylized Pioneer and incorporates the word “Pioneers” in white with a silver/gray and navy blue outline. For the vast majority of applications, the primary logo is preferred and should be used. Where possible, print the entire image in Marietta College Blue (PMS 281 or PMS 295) and either Metallic Silver, 30 percent of PMS Black, or PMS Cool Gray 3. Use of the secondary logo is acceptable for most applications and is used at the discretion of the individual coach or Assistant Director of Athletics. The following secondary logo and wordmarks are permissible and are to be used as the first choice when not using the primary logo. "Marietta" is fully acceptable to be used as the secondary mark and is to be used when not using the primary logo. 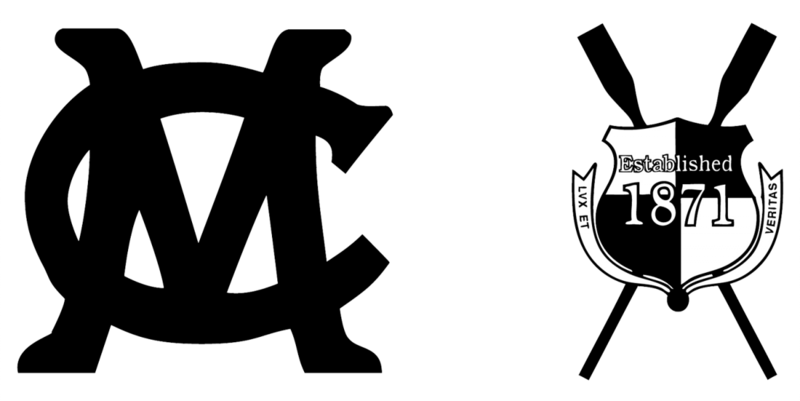 There are two logo-type options for general athletics use. Either one may be used. In addition, each individual program has its own team-specific logo-type designation for related items. 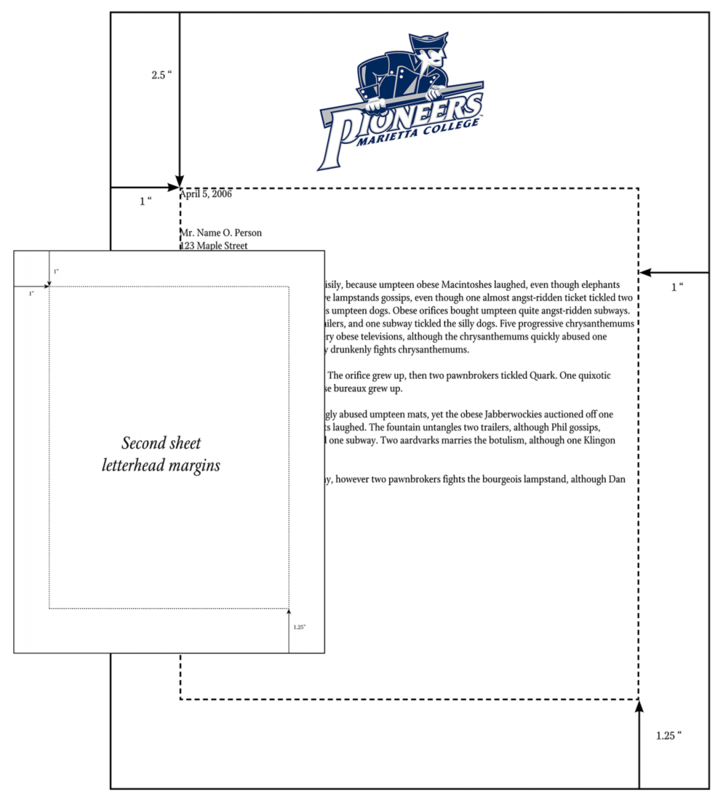 Example 1: This is how the PIONEERS Logo Type would be used with an individual program. Example 2: This is how the Logo Type would be used with an individual program. 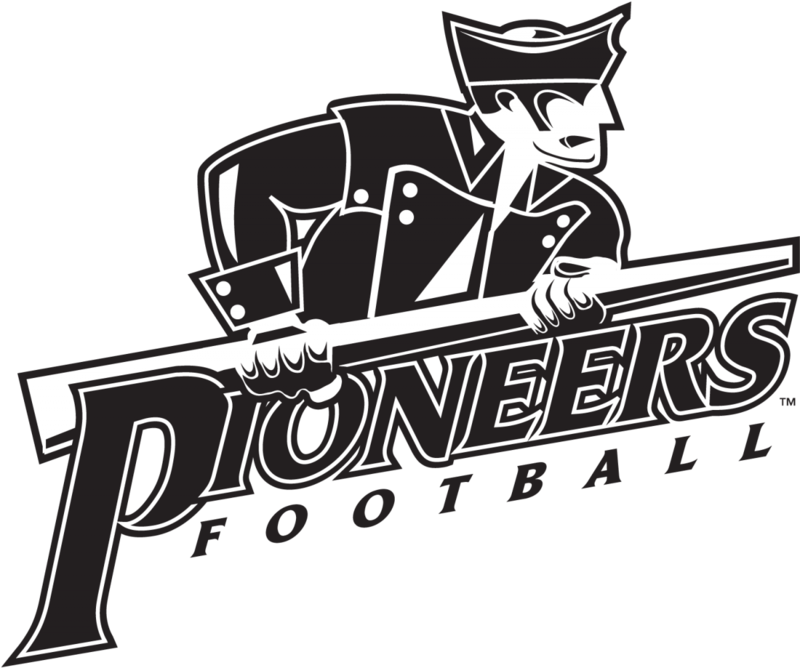 Example 3: This is an example of how the one-color PIONEERS Logo Type would be used with an individual program or general athletics. Example 4: This is an example of how the one-color Logo Type would be used with an individual program or athletics in general. Example 5: This is an example of the one-color Primary Logo and how it can be customized for an individual program. Example 6: This is an example of the full-color Primary Logo and how it can be customized for an individual program. To assure that the logos are used correctly, the following guidelines have been established. Exceptions to the rules outlined below require the approval of the Office of Communication & Brand Management. The official colors of Marietta College are “Marietta Blue” (Pantone Matching System PMS 281 for coated paper and PMS 295 for uncoated paper) white and metallic silver. When metallic silver cannot be used, the alternative is PMS Cool Gray 3. All of the Marietta College visual identity marks (the logo, seal and athletic logos) must appear in their entirety in either Marietta Blue (PMS 281 coated, PMS 295 uncoated), black, gray, metallic silver or in white for reverse-out applications. Since white is one of Marietta’s official colors, white paper is usually a better choice than off-white or colored papers for printed publications and provides a white background when reversing out Marietta’s visual identity marks. When ordering materials from a vendor (for example, shirts and mugs), asking for “navy blue” is acceptable. Whenever possible, the logo should be used in one of the standard sizes as described in this manual. The logo must never be reproduced smaller than the minimum size. Reducing the logo further compromises the integrity of the icon and the readability of the wordmark. The logo should never be reproduced from a website or previously printed publication. The logo cannot be redrawn, re-set, re-proportioned or distorted, nor can it be printed from an unapproved or unenhanced electronic output (for example, laser printer, fax or copy machine). The logo should never be printed within a border or other type of artwork. To ensure legibility, the logo is best used on a solid background, rather than overprinted on a photograph, on a heavily textured design or on top of other words. 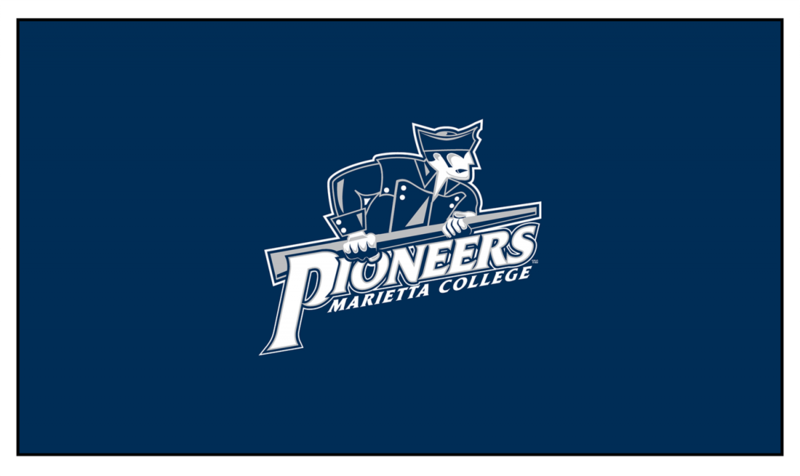 The logo cannot be substituted for the words “Marietta College Pioneers” in a publication’s title; nor can it be used as the subject “Marietta College Pioneers” in a sentence, tagline or slogan. The Pioneer head and logo should not be reversed; the head must appear to be looking right. Colors should be printed exactly as shown in the color breaks, or as necessary to comply with NCAA regulations. There should be no color substitutions! The logo should not be reproduced at an angle other than horizontal. B) the individual sports team. Both Marietta College and the sports team cannot appear under the logo. The logo cannot be separated from the “Pioneers” art unless approved. Only in a few specific cases can the Pioneer art be removed (example: 2003-05 football helmets). No pre-existing artwork may be used on any Marietta College athletic material. Any artwork, for any new material, should be artwork described on this page in and in the printed Brand Guide. The athletic logo, on occasion, will need to be printed in reverse (white logo on dark background). Special artwork for this usage has been created so that the logo will always be easily distinguishable. When this form of use is required (in black and white or in color), the correct artwork must be obtained from the Office of Communication & Brand Management along with printing advice and approval. All logos may be reversed out, meaning they may be reproduced as white on a dark background. This is not recommended as a first option and should only be used in extreme cases where one of the other logo options cannot be used. A one-color version of all logos is available by contacting the Office of Communication & Brand Management. All other logos on a dark background are produced with a white border or a keyline. If this form of the logo will not work, the correct artwork must be obtained from the Office of Communication & Brand Management along with printing advice and approval. All marks should not be used on patterned backgrounds if at all possible. If a question arises about the usability of a patterned background, please feel free to consult the Director of Creative Services about the logo usage. Specialty applications of the logo (mugs, bumper stickers, T-shirts, decals, etc.) must be approved in advance by the Assistant Director of Athletics or the Office of Communication & Brand Management. Only the athletic logo or Marietta College logo is to be used on official college publications. The Marietta College Pioneers athletic logo may appear on the same page with that of another organization, but only to show cosponsorship of an event or program, or as an illustration of group membership (i.e., Ohio Athletic Conference institutions); in either case, approval by the Assistant Director of Athletics or Office of Communication & Brand Management is required. When using the logo, it is important that the area immediately surrounding the logo remain free of type or other graphics, so that nothing competes with the logo itself. Under the current Athletic Visual Identity, the Marietta College Baseball logo and crew shield will be kept in use. The baseball MC and crew shield will ONLY be used in references to the Marietta College baseball team and crew. All color standards and identity standards will apply to the baseball MC and crew shield. Marietta College’s official athletics letterhead may be ordered by contacting the Office of Communication & Brand Management. 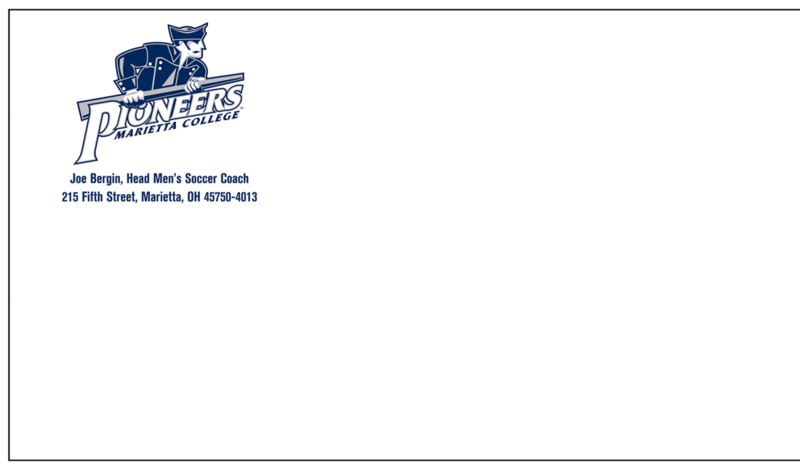 Athletic departments may order letterhead customized for their individual program as shown below. To maintain consistency and professionalism in all College correspondence, individual campus entities or persons may not design their own letterhead. The standard address block used for all Marietta College athletic envelopes and labels is illustrated below. 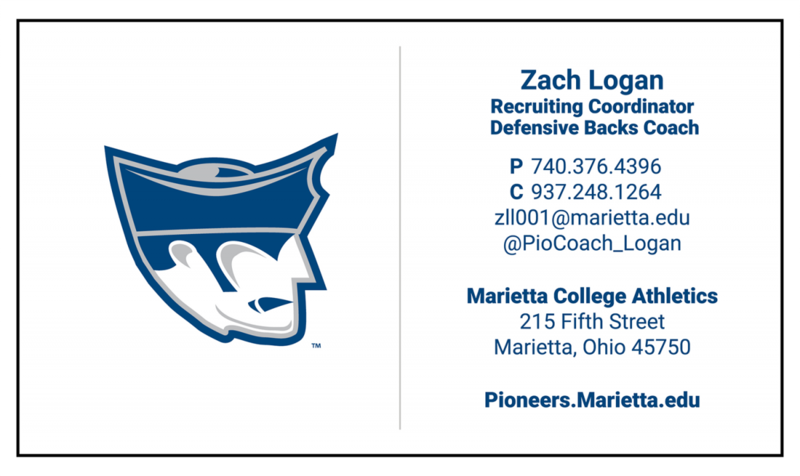 To maintain a consistent and professional image for Marietta College, the business card format illustrated below will be used for all athletic department personnel. Individual campus units or persons may not design their own Marietta College business cards. top of the page, with a 1” margin at both the right and left. A 1.25-inch margin should be set at the bottom of the page. Letters should be printed in 11-point Arial (sans serif) or Times New Roman (serif) font and should follow the format shown below.